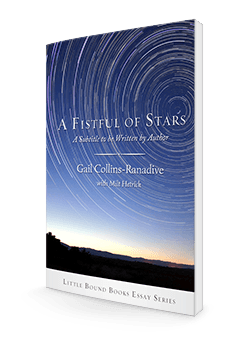 “A Fistful of Stars begins and ends with a question: ‘May I show you something?’ With the snapping of a cottonwood twig, Collins-Ranadive shows us how close the universe really is. 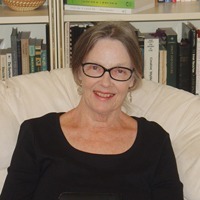 She reminds us that the heavy elements of our planet and ourselves originate from billions of years of supernovae, matter blown across the galaxy, recycled and reborn. As we look up into the night sky at our origins, the vastness of space and the questions of its beginning, end, and meaning easily overwhelms us so that it’s easier to ignore its mysteries and grandeur than trace our own story of how we came to be or why it matters. This sense of insignificance combined with our own daily struggles (mundane or otherwise) manifests closer to home where we no longer ask why our own planet matters—as if somehow surviving tomorrow as a species is less important than just one person getting through the day. Collins-Ranadive shares her own experiences where the universe reminded and continues to remind her—and us—that while it can be overwhelming, it can also be overwhelmingly wonderful, relevant, even personal. Our recognizing the science leading up to the human species and appreciating the beauty that science adds far beyond the aesthetic may be what makes us uniquely human.